Seven cities of origin. Four continents. Twenty time zones. No lost baggage. Priceless. When looking at certain eMi teams on paper, despite numerous hours of planning and prayer, one could not be faulted for wondering how such varied individuals, most whom have never met, could possibly bond to become an effective team…in a matter of hours and in a few short days. 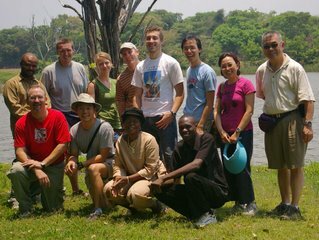 Our team to Zambia, varying in age, background, expertise and nationality, may have appeared to fit this description, but as we often say at eMi: “God puts the team together and we have the joy of seeing how it all works out.” As our team spent more and more hours together, it became clear that our common bond was a desire to serve the Lord, serve those who minister in His name, and meet the needs of the people of Zambia: we were not there as tourists looking for a trophy experience to take home. By the end of the week there was no denying the value of each member and the work God had specifically chosen for each within the team. Non-Zambians are not permitted to work in Zambia unless formal partnerships are established with Zambian professionals. For RPC, this requirement would render it bankrupt before it even gets started. Therefore, Pastor Derek Mutungu, founder of RPC, set up a meeting with the Ministry of Works and Supplies to find a solution that would allow RPC to move ahead, with its limited financial resources, by enlisting the design, engineering and technical aid of eMi. The Ministry was amenable to a solution and requested that once in-country, a meeting with the eMi team was to be arranged. Our team met with Ministry representatives both at the beginning as well as the end of our project and established a partner relationship with them: they will review all of our application and construction documents, place their Ministry name on all documents and submit everything on behalf of RPC. This will most certainly expedite our submissions and ensure smooth passage through the authoritative bodies. 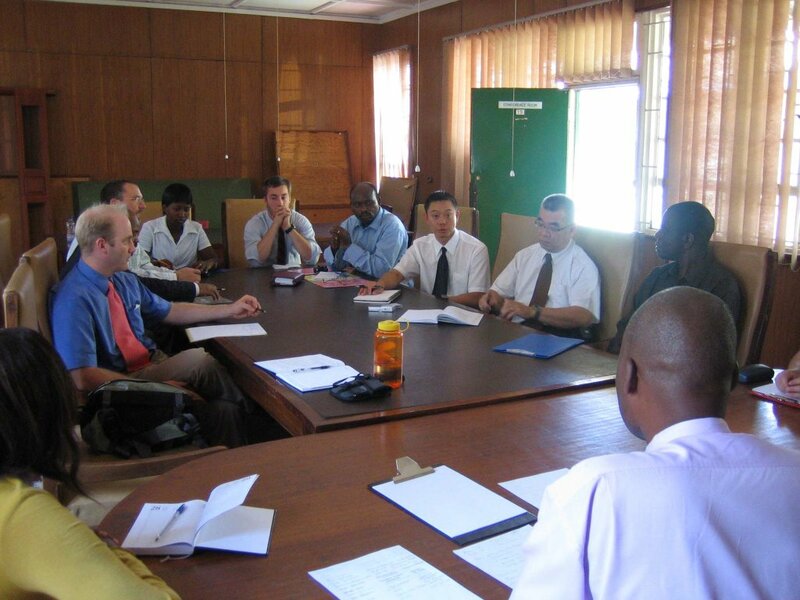 Throughout the week we met several other government and service providing authorities and although we were typically met with initial reticence, the stated goals of RPC and our expressed desire to respect local practice and meet or exceed local standards of environmental safety standards, won over many of the officials. We spent most of the week discussing about the growing and processing of chickens. 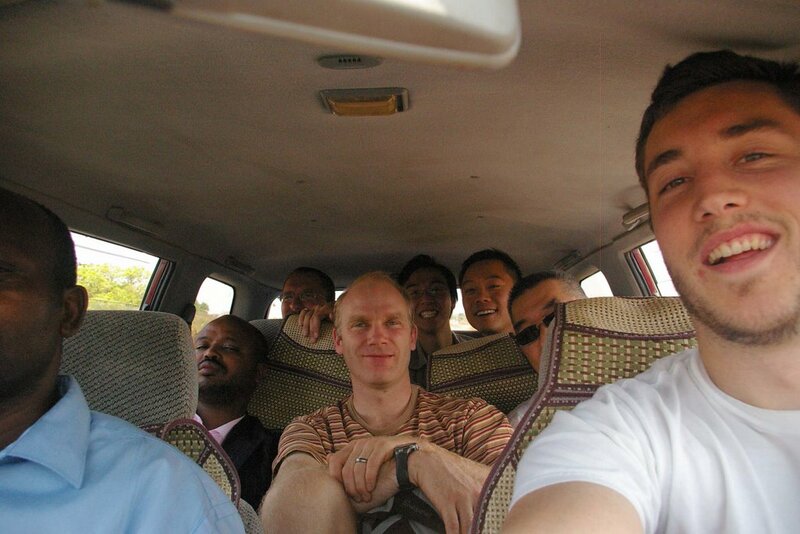 So it seemed oddly appropriate that we found ourselves spending almost five hours like chickens in a coop as our seven men plus Pastor Mutungu, crammed into a little six seat car for the ride from the capital Lusaka to Ndola. It was a “bonding” moment to say the least as we pulled over almost every half hour to untangle ourselves and rotate the seating order. Of course we laughed about it...several days afterwards. We always tell our teams to expect the unexpected. Although what initially appears as a setback often results in positive steps forward, this is sometimes hard to appreciate at the time. 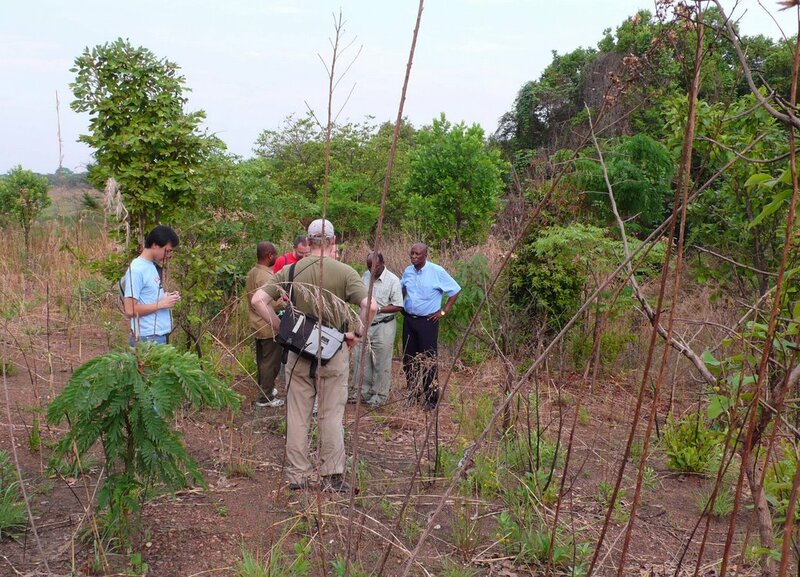 When we walked our site and discussed our analyses from the vantage of various specialties, we concluded that although it did have many merits, the chosen site was inadequate in terrain, shape and size for what would need to be placed on it. Although RPC will be modest in facility requirements at its inception, its plans to become increasingly involved with various aspects of the industry will require a considerable amount of land. For the remainder of the week, much of what the team did would become the basis for choosing another property. Using the extensive prior research done by Pastor Mutungu, about all aspects of RPC, the eMi team conducted several detailed analyses, from fertilizer blending to chicken processing. It also studied the machinery involved in these processes, water/waste water requirements, power requirements and land requirements for administration buildings, production facilities, support buildings, roadways and water treatment. The team also made recommendations regarding water acquisition, handling and re-introduction into the environment. Meanwhile, in the midst of all this engineering, a civil engineer from our team who is also seasoned in project and construction management was involved in a critical analysis of the business plan and how RPC is to integrate it step by step with the engineering and design of the facilities. All this research by the volunteer team will now be compiled into a detailed report to be submitted to RPC from eMi and will form the bases of future endeavors in design and engineering to move the project ahead. eMi is dedicated to partnering with RPC until it becomes a viable business whereby it can begin to afford to hire its own Zambian professionals. Until that time is reached, eMi will continue to provide guidance and advice through the continuing involvement of its staff and volunteers. 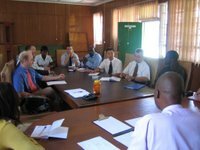 Chad Gamble, Director of the eMi East Africa office, was invited onto this team for the expressed reason of building and maintaining a close tie between eMi, RPC and Zambian Government partners and officials. A number of individuals on this team expressed a desire to maintain their involvement with Pastor Mutungu and the work of RPC. Prior to the trip we made arrangements through Pastor Mutungu to connect with the Buseko Children’s Home in Ndola. Two wives of our engineers who came along on this trip spent the week caring for and playing with these children. 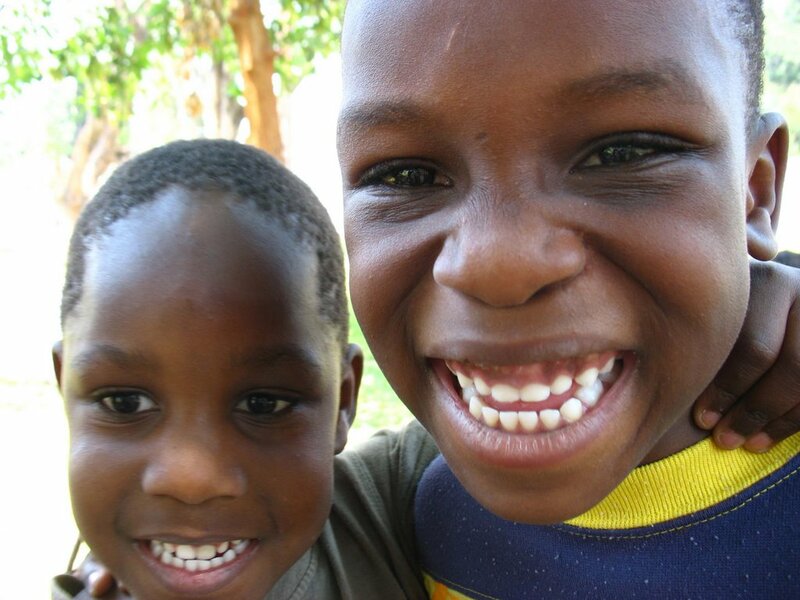 All the children at Buseko came as orphans and have HIV/AIDS. As a team, part of our preparation for the trip involved bringing items from home to share with these children. In the middle of our work week our entire team visited Buseko (which means ‘laughter’) and spent some time playing and interacting with the kids. It must be difficult to have people like us come and go, but we hope and pray that such visits will at least represent hope and provide some love which these children may never have received if Buseko Children's Home did not exist. The final thought I have is in regards to the overwhelming welcome we received from the people of Zambia. Our hosts, hostesses and drivers were all volunteers who went out of their way to make us feel welcomed. Families literally opened their homes for us to stay and some ladies rose before the roosters to prepare meals before we left for our morning meetings. Both in Lusaka and Ndola we were warmly received as we felt like the brothers and sisters in Christ that we all are. Pastor Derek Mutungu became an inspiration to our team, as a person dedicated to the Lord and to a vision. He has dedicated countless hours towards making RPC a reality in order that it may be a blessing to his fellow Zambians. We did not go to Zambia to “lead” but to “come alongside”, and for that privilege and the moments that we shared, we are all thankful. Please click on the Photo Gallery to see pictures from the trip. "...rose before the roosters..." I like that. Thanks for the update Greg. The work with RPC sounds great.